Picture the scene: You’re riding your bicycle along a dirt road near Prolit village near Siem Reap when a tuktuk flies by. Nothing new in this part of the world, right? Until you notice the driver is dressed as Fred Flintstone. Another one bumps along in your rearview mirror. This one’s driven by an Aussie with a painted face. The next one bears an American flag. 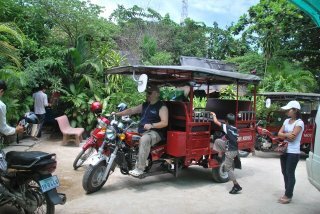 Then there’s the piece de resistance – a gold trimmed tuktuk complete with padded leather seats, a TV/DVD, electric fan and mood lighting. It’s invasion of the tuktuks, barang (barang is the word used for a foreigner in Cambodia) style – better known as the MaD Tuk Tuk Challenge. Born from the ingenuity of MaDman, Phil Starling, the event is truly one of a kind. The Rhodesian-born, Australian-transplanted Cambodian resident with a ’farmer slash I.T. background’ planted his derriere in Siem Reap in 2007 when he moved there with his wife and started up an NGO called Making a Difference for Good (aka MaD). 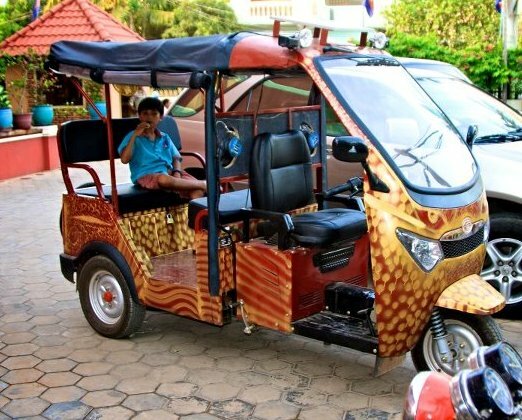 Not only does his self-pronounced obsession with tuktuks provide him and his family with transportation (and a reputation), it also acts as a vehicle to raise funds for worthy projects in one of the poorest villages in Cambodia. Every year around this time a posse of tuktuks hits the road in Siem Reap and heads north-west. First stop is Prolit village, where drivers visit the beneficiaries of MaD’s fundraising and then it’s a free-for-all as they dash around the country for 11 days, rocketing along highways, bumping across fields and swerving cows and pigs on dirt roads. Each team can outfit their vehicle as they choose and designs have included a pirate ship, a desert island tuk tuk (with a palm tree and thatched roof) and a Flintstone car (complete with stocking legs hanging from the bottom). It costs $2,000 per team to enter the race (with a maximum of three members) and every penny goes to buy tools and fuel, repair motorbikes, pay salaries and other ‘non glamorous’ items needed by the village. Phil owns all the tuktuks which are specially built for him and delivered to his doorstep. As for the teams – they come from far and wide to get filthy, sweat a lot, deal with numb bums and teasing from the locals and swat mosquitoes along the trail. There’s Sarah from New York, Sean from Canada, Thom and Jai from England, Lynnely from California, Penny from Australia and Jad from Lebanon (who lives in Qatar) as well as a handful of expats living in Cambodia. Over the years there have been lawyers, doctors, students, professionals and a wide range of people seeking thrills of a different kind. And, while a couple of them went a bit off the deep end causing them to be sent home or reprimanded, the majority come along for two things: Adventure and Assistance. Accompanying the group will be a doctor to provide free healthcare to monks and nuns in pagodas where the tuktuk riders settle in for the night. And, for those who don’t have medical experience, there are opportunities to jump in and do sing-alongs with the kids, teach a few English phrases or volunteer their services in any way that may be needed. The average distance covered every day is 180 kilometers, with a number of stops along the way. The rally hits the road on April 6 and there are still openings for a couple more teams. And if 11 days on the road sounds too much like roughing it, the MaD team is planning a selection of shorter trips for the coming year. Check out the Mad Tuk Tuk Challenge Facebook page.